A fascinating and singular figure in postwar art, Salvatore Scarpitta (1919–2007) created a powerful body of work that ranges from nonobjective abstraction to radical realism. Deeply admired in Europe, where he began his career, the artist has yet to be fully recognized in his native United States. Please join us for an informative dialogue between Germano Celant, artistic director of the Prada Foundation and former senior curator of contemporary art at the Solomon R. Guggenheim Museum, and Paul Schimmel, former chief curator of the Museum of Contemporary Art, Los Angeles and organizer of Destroy the Picture: Painting the Void 1949–1962. 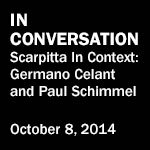 They will discuss Scarpitta’s significant contribution to visual art, his critical reception, and his first-hand experience of World War II. Salvatore Scarpitta: Traveler will be on view through January 11, 2015. Salvatore Scarpitta: Traveler is made possible in part by the generous support of the Estate of Frank B. Gettings, in memory of Nancy Kirkpatrick and Frank Gettings; C.P. Beler; the Holenia Trust; and the Hirshhorn Exhibition Fund. The exhibition brochure is generously underwritten by Kristin and Howard Johnson and the Italian Cultural Institute on the occasion of Italy’s Presidency of the Council of the European Union from July 1 through December 31, 2014.